RCG I know what you mean, but “wandering policies of Obama ” … I don’t believe they are wandering at all, they are consistently designed to transform the US into a communist country. Just remember y’all, we’re on the same team. Keep winning those local districts, etc. and get the political power to restore the USA. The left will use all forms of deception and cheating just to win. Good vs Evil? Which one which? Both are in the grips of the Corporate elite. Trying resolving a complaint as a consumer. You get an idiot who reads right off the pre planned response sheet given to them. We have destroyed this nation; not the socialist policies coming from Washington. We are turning out college grads that are complete idoits. I recently was trying to enjoy an after work drink and sitting next to me was a man and woman. I was soon brought into a converastion with them and what I found was shocking, but makes my point. The male was a corporate type and his female companion an attorney. The total lack of knowledge about history and the basics from these two was amazing. The attorney actually argued with me that the Supreme consists of only 7 Justices. She even got hostile about and reminded that she was attorney. I then pulled up the US Gov website and proved her wrong. She never consented and just changed the subject. She really learned alot in Law School didn’t she? We are killing ourselves from within. Today the point is not what you know, but how well you spin it to make people think you are right. The male in this conversation did not fair any better. He actually thought that LBJ was president during the Watergate scandal. We have produced highly paid idiots in this country. Once agian I will soon be hanging up my uniform and never looking back! I may even fly my flag upside. Of course no one will have a damn clue what that means. You say America will not be a world power when it happens……well friend we are very close. On our present course it will not be much longer until we have given up our world power status. Who is to blame? Obama? Bush? Clinton? The answer is none of the above. We the people are to blame. For the past 30 years we have allowed the “yuppie” mentality, greed and complete stupidity to rule. We have watered down our education sysytem. We have chosen to blame victioms not criminals. We rush home to vote for American Idol, but not a real election. We depend on the Limbaugh’s and other idots to tell us what to think. No one is balme, but ourselves for current position. I am saddened to think that it may be too late for America. The damage has been done. After 28 years in uniform I must ask myself if it is really worth fighting for anymore. My son wants to join in a few years, but unless I see a change I will try my best to convince him not too. Today we have a choice of continuing the wandering policies of Obama or electing a money grubbing, greedy corporate raider. Great choices huh….? 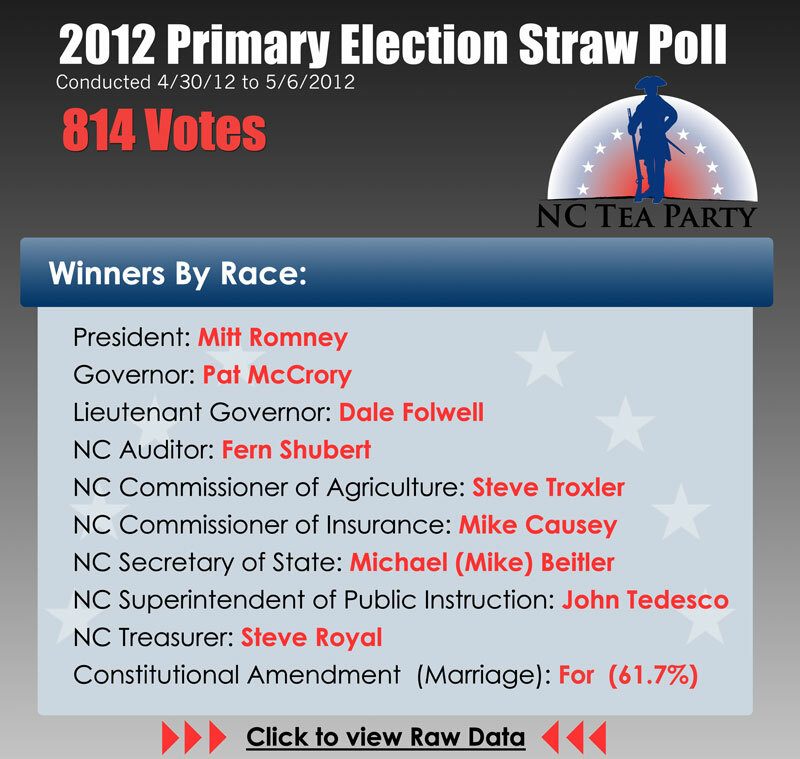 Thank you for taking the time to take and publish this straw poll. It is helpful to see what other Tea Party minded folks in NC are thinking. God help us as the Presidential election is the most important in American history. It will restore respect of “everything American” or destroy our Constitution and plummet this great nation into meaningless nothing. However, America will NOT be at Armageddon, i.e. we will not be a world power when it happens. He that has ears, let him hear. It is past time Christians stood up for what the Bible teaches. It is time we repent and turn from our sins, and our Heavenly Father will heal our land. Faith!! !